Specialised flooring projects require specialised flooring trims. To meet market demands, Kirk has continued to innovate and create flooring trim solutions using different materials, textures, designs and colours. 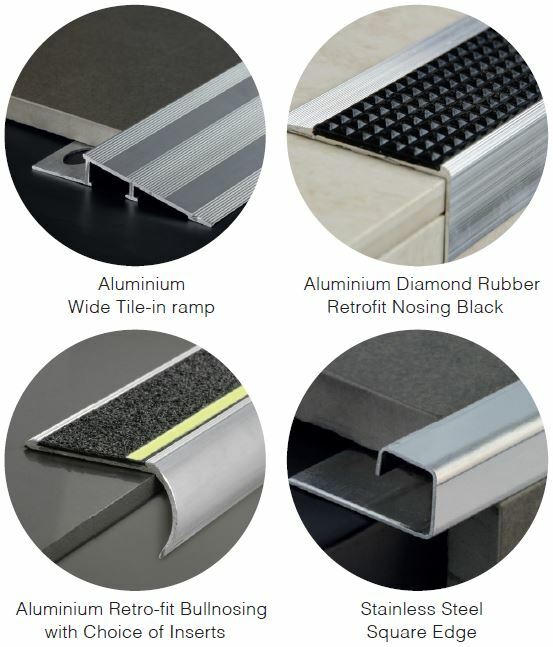 Floor trims such as ramps, covers, edges, stair nosings and transitions are generally made from aluminium, which is extruded into different designs and anodised or powder-coated to different colours and textures. The company’s stair nosings have been designed with different insert types to take into account a variety of pedestrian loadings and non-slip requirements, including the luminescent offerings for safety in load shedding. Kirk recommends that the thicker 3mm sightline aluminium straight edge be specified in order to accommodate the loads on floors. In high traffic flooring installations, brass and stainless steel floor trims should be specified as these materials are tougher and also provide the designer different material options. Stainless steel floor trims, for example, are available in patterned, brushed or polished stainless steel. There are different stainless steel floor trim grades available from Kirk and the grade needed will depend on proximity to the ocean and the corrosiveness of the environment, among other factors. Brass can withstand different climates and environments. It is used for aesthetic looks and loading capacity and is a more expensive option. Foiled and anodised aluminium covers are required for all floating floors, such as wood and laminate, and are used to cover the expected expansion and transition of these flooring types. The experienced professionals at Kirk can give you the advice you need regarding floor trim materials and options for your project.